Erected 1975 by the Town of Cromwell, the Cromwell Historical Society, the Connecticut Historical Commission. the right when traveling south. Touch for map. 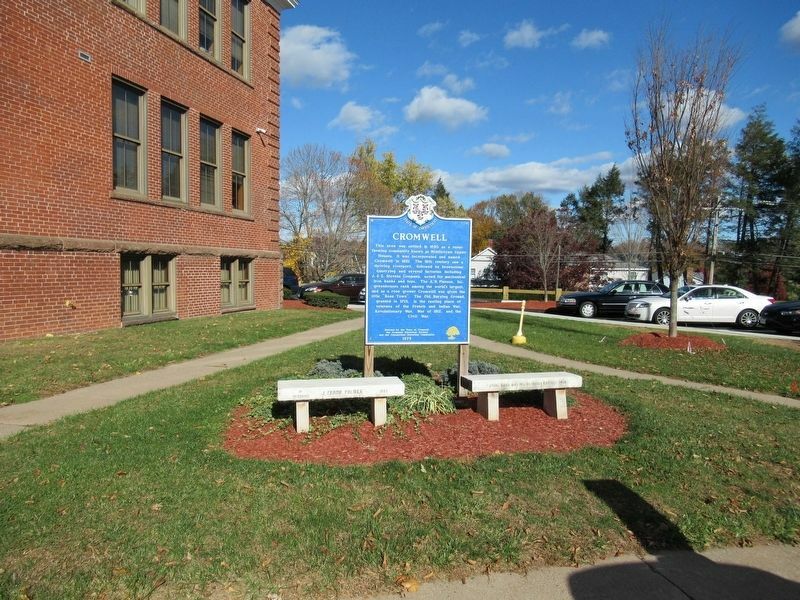 Located in front of Cromwell Town Hall. 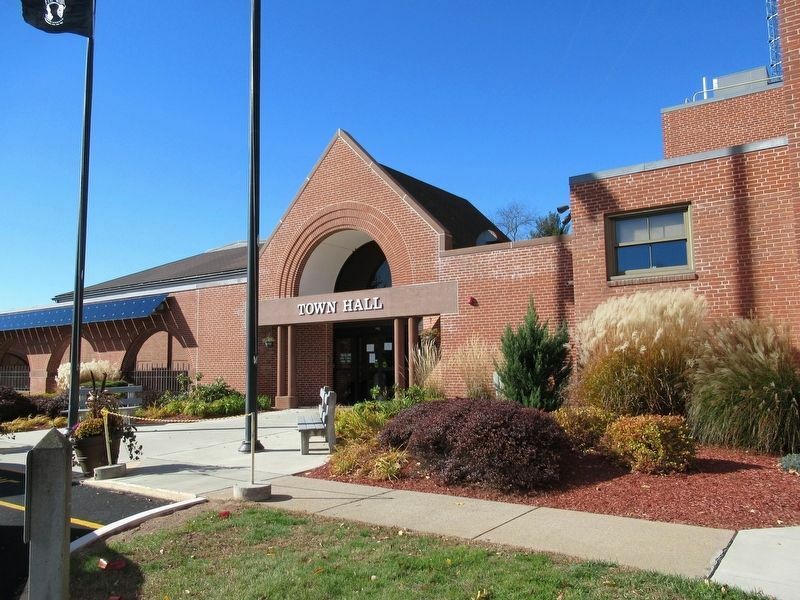 Marker is at or near this postal address: 41 West Street, Cromwell CT 06416, United States of America. Touch for directions. Other nearby markers. At least 8 other markers are within 3 miles of this marker, measured as the crow flies. Cromwell World War I Monument (approx. 0.3 miles away); Middletown Upper Houses (approx. 0.4 miles away); Settling Middletown (approx. 2.2 miles away); Founders Rock (approx. 2.2 miles away); Commodore Thomas Macdonough (approx. 2.2 miles away); St. John Church (approx. 2.2 miles away); The deKoven House (approx. 2.4 miles away); deKoven House Community Center (approx. 2.4 miles away). Touch for a list and map of all markers in Cromwell. More. 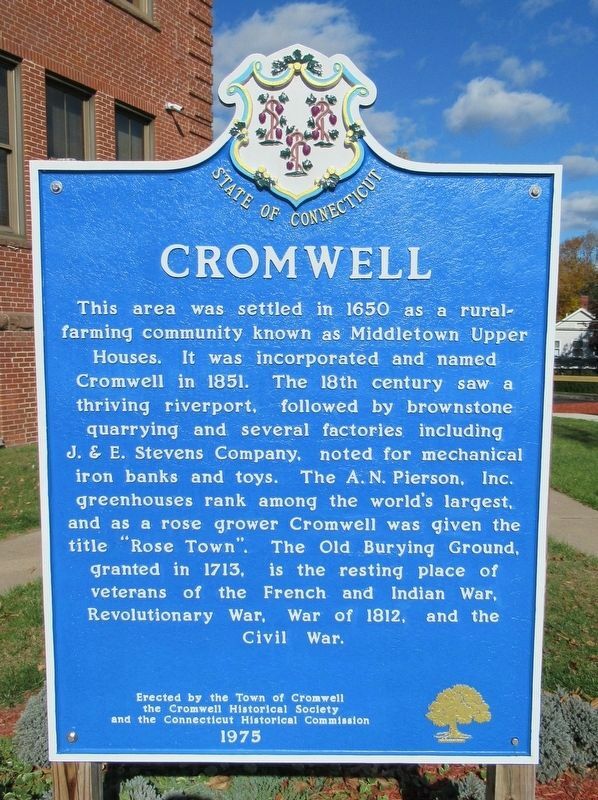 Search the internet for Cromwell. Credits. This page was last revised on November 12, 2016. This page originally submitted on November 12, 2016, by Michael Herrick of Southbury, Connecticut. This page has been viewed 157 times since then and 5 times this year. Photos: 1, 2, 3. submitted on November 12, 2016, by Michael Herrick of Southbury, Connecticut.